I've been asked by a reader of this website why there are no references to the various technical solutions available for wind turbines on rock. The truth is that I’m not a specialist on this topic. However I’m learning, due to the fact that I’m currently working at several projects in northern Europe where it can be applicable. To solve the problem I’ve decided to start with a video, that can be better than a 1000 words. It’s an example of foundation on rock without anchor cage – one of several possible technical alternatives when the turbines are above shallow, unfractured rock. 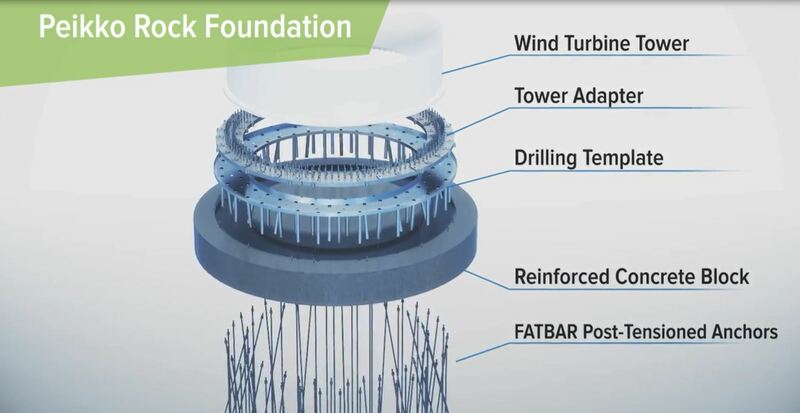 Basically the tower rest on a steel “adapter” plate on top of a reinforced concrete block, and the turbine is fastened to the ground with dozens of post-tensioned anchors several methers long (figures above 9 or 10 meters are not unusual). There are some very clear benefits with this solution if the geology is favourable: for instance less excavation, almost no blasting and lesser use of materials. This video has been done by Peikko, a Finnish company specialized in steel elements. They have an interesting, unusual business model, as they do the engineering for the foundation and provide the steel but not the concrete or the manpower – therefore the foundation has to be built by another company. This entry was posted in Towers & Foundations and tagged rock adaptor, rock anchor by Francesco Miceli. Bookmark the permalink.